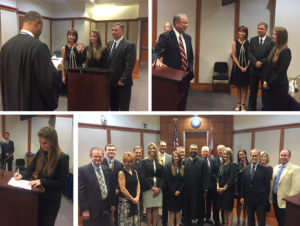 APRIL 23, 2018 – Congratulations to Attorney Nicole Price, who was sworn in today by Chief Judge Charles E. Williams of the 12th Judicial Circuit. Nicole was joined by her mother (Marie), father (Maurice), and many colleagues and friends. Firm President Bob Lyons officially welcomed her as our newest associate.